I have never participated in a cookie exchange. When I got the invite to my first one, I knew what I had to do. It was time to tackle the famous Czech Christmas cookies. Some years, I’ve “helped” my mother-in-law in the sense that I roll out dough, or make shapes and transfer the cookies to baking sheets. But I’ve never really “made” the cookies, and I’ve wanted to learn for years. So, now was my chance. Instructions for the cookie exchange gave these parameters: sign up early for the cookie you want to bring so that there are no duplicates. Prizes will be awarded in several categories (nothing like a little competition to motivate me!) and make 14 pre-packaged bags/boxes containing at least 5 cookies each. I knew I didn’t have to worry about someone trying to make the same kind of cookie as me—these cookies were pretty unique. But, I did have to worry about actually making the cookie. Since Alena makes at least half a dozen different types of Christmas cookies, I focused on keeping it simple with ONE. I knew which was my favorite (the ones with the jam inside! ), so I asked her for that recipe. She brought over a 60+ year old cookbook that came from her mom—a stack of well-worn pages held together by a rubber band—and proceeded to translate the Czech recipe for me, plus offer plenty of instructions. The biggest was to make the dough ahead of time to allow it to get extra chilled, since rolling out a dough with so much butter was next to impossible when warm. Jan was anxious to help, so one night, I brought out the ingredients and he supervised. With just a few ingredients in the dough, we were done in a matter of minutes. I had wanted to make the cookies a day or two before I needed them, because I knew that’s how Alena always did them, but it was a busy week and that didn’t happen. So, on the day of the cookie exchange, it was crunch time. I spent a lot of time at first figuring out the best technique to roll out the dough. I finally settled on this: parchment paper, dusting of flour, dough, another dusting of flour, and then another sheet of parchment paper. Use a rolling pin to roll out this parchment paper sandwich. Then, everything gets a quick chill in the freezer (just to cool the dough down, not actually freeze it). Then, use the cookie cutter, and don’t remove it until the cookie is on the baking sheet (with Silpat on top). Jan got to work filling the cookies with marmalade and jam, then he added chocolate and nuts on top of half. I was packing the cookies into my 14 cardboard containers at 2:55. The cookie exchange started at 3:00. But, I didn’t end up being too late—the exchange was at my neighbor’s. Let’s just say I was so relieved there was milk in the refrigerator, there were so many delicious cookies to try! When the ballots came in, I won “most unique and/or innovative”—I was thrilled! Use a digital kitchen scale to measure out flour, butter and sugar. In a mixer, cream together room-temperature butter with flour and sugar. Add egg yolks, baking powder and lemon zest, mix until well combined. Divide dough in half and wrap each ball in plastic wrap. Refrigerate overnight or until completely chilled. When you are ready to roll out the cookies, preheat the oven to 350°F. Place a piece of parchment paper on a flat work surface. Sprinkle flour evenly over parchment paper and place the dough on top. Sprinkle flour on top of the dough, then cover with another sheet of parchment paper. Roll out to approximately 1/8” thickness, checking frequently to make sure the dough is not sticking to the parchment paper. TIP: When working with the dough, you will need to work quickly or the butter in the dough will melt. If the dough gets too warm, place it in the freezer for a few minutes. You can even put the rolled-out sheet (between the two pieces of parchment paper) in the freezer before you use the cookie cutters. Use cookie cutters to make shapes. For the fruit-filled cookies, make two of the same shape: one regular, and one with the center removed (I used a thimble to remove the center). 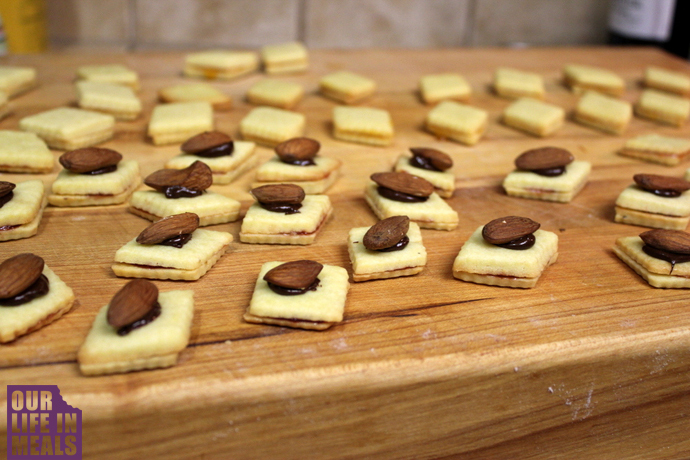 For the nut-topped cookies, you will make two of the same shape to sandwich together. Bake for 9 minutes, or just until the edges barely begin to brown. Cool on wire racks. For the fruit-filled cookies, spread marmalade or jam on the bottom (pan-side) of the regular cookie, then place the same shape (with center hole removed) on top. Sprinkle with powdered sugar. For the nut-topped cookies, use a double-boiler to melt chocolate chips. Spread marmalade or jam on the bottom (pan-side) of the regular cookie, then place the same shape on top. Place a small dab of melted chocolate on top of the cookie, then place an almond or walnut on top of that. Store finished cookies at room temperature (cookies taste better at least 1 day after baking). They are on the table, waiting for you! “I brought peanut butter bacon cookies because they are trendy and I wanted something that would be very Christmas 2012,” said Forst.